" ... boleh dianggap sebagai satu pembohongan kepada rakyat sekiranya beliau gagal mendedahkan perkara itu menerusi satu sidang akhbar khas." 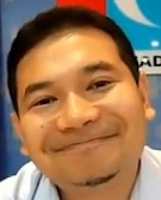 "Rafizi ni tak paham securitisation langsung lah tu, which involved sale and securitisation of rights to receive future $..... Dia ni ingat Govt 'mortgaged" assets in its true sense kot, macam kat UK which used the term mortgage loosely in the situation where kita ambil loan to finance our house purchase, or remortgage (to release some equity therefrom)." ".. we need people like you to argue with people like rafizi. all this while they have misled the people with half truths or outright lies"
".. the news portal as big as the malay mail should have financial experts to advise them b4 publishing stupid news like this.. "
Rafizi Ramli, whose real-world job experience is limited to a brief stint with Petronas, doesn't know anywhere as much as he likes people to believe. Read the expose by the blogger SatD, The Poyo Boy Wonder or Mat Rempit Bawah Tempurung? Unlike Rafizi, SatD has got serious real-world working experience that includes advising foreign governments on securities, banking and finance. Please leave your thoughts at his comment box h e r e.